Meg Says: #MegSays10k Urban Decay & Zoella Beauty Giveaway! 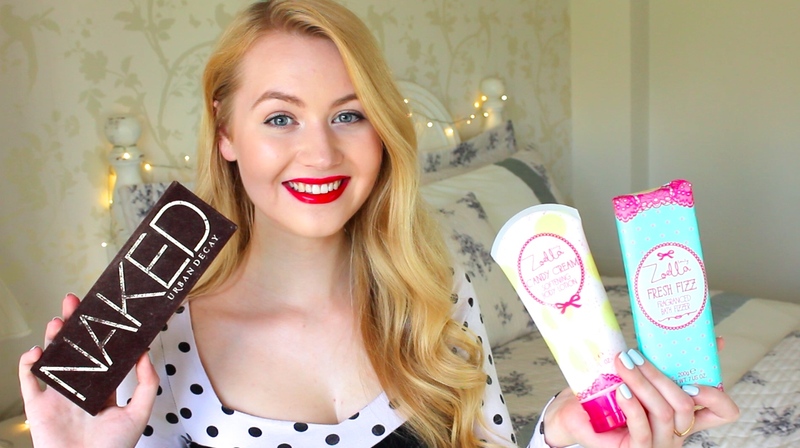 #MegSays10k Urban Decay & Zoella Beauty Giveaway! First things first, I'm the luckiest. Lucky to have such wonderful people supporting me, and lucky to be enjoying something so wholeheartedly. When I uploaded my first video - here if you missed it! - I honestly didn't think that even one hundred people would care enough to subscribe to my channel. Now there's over ten thousand of you who care enough, which gives me ALL of the warm fuzzies! Back in December I was simply 'giving YouTube a go' as I'd so wanted to for years and years, and I didn't expect the amount of support and kindness that I've received over the past seven months. Although we are celebrating a milestone together right now, it really is all about the fact that there's 10,000 individuals rather than the number as a whole and it always will be. I won't waffle on too much as I've got a giveaway to explain, but I want to express my gratitude and say how truly appreciative I am 10,000 times over! Thank you to every single one of you. To say thank you, I'm holding a giveaway - there will be one main prize and two runner-up prizes, so three winners in total. Here are all the details/T&Cs! The entire giveaway (main prize and runner-up prizes) are open internationally - you can enter wherever you are in the world. You're welcome to enter all three giveaways if you wish. The giveaway starts on Wednesday 22nd July 2015 and ends at 12am on Wednesday 12th August 2015. The three winners will be announced and contacted on Thursday 13th August 2015. If you are under 16 years of age, please ask a parent/guardian for permission before entering. Good luck! You must use the Rafflecopter form below - simply log in and follow the instructions! Use the Rafflecopter form to complete or confirm these two mandatory steps. The rest of the steps are optional, and allow you to enter yourself into the giveaway multiple times. Please use the Rafflecopter form to complete these steps if you wish! Again, use the Rafflecopter form to complete or confirm these five optional steps. A winner will be chosen from the Rafflecopter entries and I will then contact the winner via email on Thursday 13th August 2015. Please be aware of fake accounts - I will only contact you from my megsaysemailme@gmail.com account. There will be two runner-up prizes; one on Twitter, one on Instagram. A winner will be chosen from the retweets and I will then contact the winner via Twitter Direct Message on Thursday 13th August 2015. Please be aware of fake accounts - I will only contact you from my @megsaystweet account. A winner will be chosen from the hashtag and I will then contact the winner via Instagram Direct Message on Thursday 13th August 2015. Please be aware of fake accounts - I will only contact you from my @megsays_ account. All three winners will be given an equal, reasonable amount of time to respond. Please keep an eye on your emails/social media inboxes on Thursday 13th August 2015 as another winner will be chosen in your place if I can't get in touch. And that's everything! I also made a video about this giveaway on my YouTube channel here. If you have any questions please leave them below and I'll do my very best to get back to you. Finally, thank you so much again and good luck! Hey Meg! I've had a real short chat with you on twitter before, and I have a few questions to ask of you. First: What is Rafflecopter and how can I access it & how does it work? Second: In this blog post, you wrote under the subtitle "Twitter Givaway", in the point 2. I can't click there to retweet on my mac.. Is there another way I can? Meg, you are a stat - it's impossible to stop saying it. Computers, distance - you make it all nonexistent, I always recieve so much warm feelings from you, it's always like we are chatting without anything between us. Thank you for sharing with us, with all 10,000 and more individuals, with me, you wonderful personality. And honestly, though I always remember that writing, filming, editing, commenting etc. are really hard with ME, I could have write most of my comments if you don't have this illness, too. It's just amazing job of a wonderful girl, that's it. Send you my love! Meg words can't express how lovely you are! 10,000 subscribers is amazing but I know I'll be here to witness when you go flying even higher than that which I know you will, you deserve to. It's so lovely of you to do a giveaway I mean being able to watch your videos is enough, I just love them so much they always make me so happy! I have one question, forgive me for being an idiot, how do you repost something on Instagram? I've been trying to figure out how to do it for ages and now I'll need to do it to enter the giveaway haha! Oh congratulations to you my amazing friend! I'm so proud of you for achieving so much in such a short time, you're doing SO WELL <3 I will always be here to support you, can't believe that we've been here together since Day 1 of this version of Meg Says and AHH I"M JUST SO HAPPY FOR YOU!